Anthony Davis owns Rough Ends at 1058 N. Gettysburg Dayton OH 45417, you can call 268-6114 to make an appointment, or just stop in. 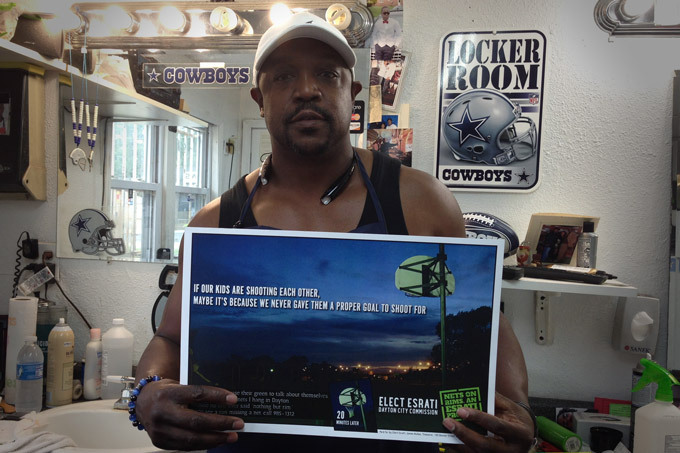 Obviously, Anthony is a Cowboy’s fan, but, he’s even a bigger fan of giving kids in Dayton decent courts. He kicked in $10 which buys 5 nets so kids can have proper goals to shoot for. While I was in the shop, Dr. Richard Melson from Dayton Public Schools stopped in. He’s the head of technology- and I gave him a piece of my literature explaining how I want to make sure all Dayton Public School kids have a fair shot at being digital natives. You can’t get a job out of high school if you aren’t computer literate- and only having one computer for every 4 kids ain’t going to cut it. That’s why I’m running for City Commission, and out hustling in barber shops. I’m counting on guys like Anthony to help spread the word about my $10,000 campaign and my green nets on basketball courts instead of yard signs.